The title, Fantastic, with its double meaning; something brilliant and splendid, or a fantasy, an ideal that exists only in the imagination, and with Wham! I think there was a touch of both. I remember an interview in the NME in early 1983 – I think Paolo Hewitt was the interviewer – where the duo talked movingly about being unemployed in the middle of a town where there was nothing going on, and their need to get away from that nothingness. It turned out that George Michael’s need was greater than Andrew Ridgeley’s, or it was Andrew who ceaselessly urged an unutterably depressed George, slumped over the kitchen table, to get up and do something with his life; this George Michael, who in childhood already had a horror of other people, or what they thought about him or the way that he then looked. The actual story wasn’t that far away from the story they told Hewitt; both had already been in a ska band called The Executive which hadn’t gotten anywhere beyond an endless round of dead end gigs and record company rejections. Ridgeley reckoned that the A&R people were too old and out of touch; Michael wondered whether The Executive’s songs were really good enough. Certainly his father derided his ambitions in this area, only for Michael finally to turn around and exclaim that he had been listening to this criticism for five years now and it was doing him in. He, he had decided, was going to go down this path whether his father liked it or not. When listening to the impertinent exuberance of songs like “Wham Rap!,” therefore, it is important to consider the extensive history of pain which lay behind the duo’s apparent laissez-faire approach to life and that thing called “work.” After The Executive rather messily broke up, George and Andrew sought out other musicians to start a new band, but these people drifted away, and they were finally left on their own. “Wham Rap!,” which originally came out in May 1982, was viewed by most commentators as a cheery one-off, bridging the “dance, don’t riot” and “Hard Times/ripped jeans” cracker barrel philosophies (“Don’t let hard times stand in your way!” and remember the Human League). Actually, it’s more than that; the Penthouse And Pavement influences are easily spotted, from Ridgeley’s chugging guitars via Bob Carter’s deadpan piano chords to John MacKenzie’s “Good Times”-ish bass, but the song’s apparent good nature belies a very palpable anger, one I suspect directed at George’s forebears as much as the Government of the time. No, he exclaims, he’s not going to fit in, surrender to the nine-to-five anti-ideal; he will do exactly what he wants to do, instead of settling for twelfth best and rotting. On Fantastic we hear the full 12-inch version, with different lyrics to the 7-inch edit, so miss pearls like “Well, listen Mr Average, YOU’RE A JERK!” and the slightly desperate “You can dig your grave, I’m staying YOUNG!” However, we do get things like “HEY-JERK-YOU-WORK!,” and “I CHOOSE to CRUISE!” and a general air of insurrection, particularly when we reach the call-and-response section (“Do you want to work?” “NOOOOO! !” “Are you gonna have fun?” “YEAAAHHHHH!!!”). There are attacks on Thatcher’s maladministration (“So they promised you a good job – NO WAY!”) and a more general feeling of nascent Generation X (both men were born in 1963) in that they are rejecting everything that “society” has to offer except what it can happily take from society (“Take pleasure in leisure,” “’Cos the benefit gang are GONNA PAY!”). One critic at the time complained that only in his worst nightmares did he imagine that there would be a top ten song with backing vocals of “D.H.S.S. !” and saw it as a surrendering to Thatcherism. But “Wham Rap!” is, if anything, a furious REBUKE to Thatcherism; yes, we’ll take the surface of what your promise but know that nothing, but NOTHING, lies underneath. And yes, if you were out of work and had a family to feed, being on the dole was no fun at all. But if, in the eighties, you were young, you could probably find yourself a pretty decent standard of living without actually having to work; rents were cheaper, as was the cost of things in general, supplementary benefit could be supplemented by housing benefit, and if you really had something to offer you could go for the Enterprise Allowance Scheme – one of Thatcher’s very few good ideas - and get £40 a week (which went an awful lot further back then) to help get yourself up and running. None of this, of course, is possible now; but “Wham Rap!” still, I think, speaks to the younger dispossessed, those who get routinely rebuked by newspapers for not going out and voting, when what the Westminster-centred/fixated press don’t understand is that the centuries-old system has simply failed to work for the next generation, who instead of stuffing envelopes with leaflets and knocking on doors have decided to ignore the system altogether and try to work out a new way of living as a society. Listen to this morning’s Prime Minister’s Questions, with the near-autistic spewing of clichés and corporate tropes (“hard-working,” “enterprise boom,” “who made a mess of such-and-such IN THE FIRST PLACE?”) and the fatally timid “attacks” from an alleged Opposition, all bearing the stamp, and about the same level of intellectual advancement, of baying public school debating societies – who as far as I can see promise only a politer variant of more of the same – and you can understand why people now, as then, decide that this is just not for them, does not speak for or to them. But there are seven other songs on Fantastic, this tale of escape from the nothingness of suburban Hertfordshire – George Michael was born in East Finchley, and it could be argued that he has never really left the airy corridors of north (of) London suburbia; he grew up in Kingsbury which, though strictly speaking part of London (NW9), is in practice so far away from the capital he might have been in Lerwick (although he could get long, winding bus rides to Golders Green and Ealing), followed by stints in Radlett and, finally, Bushey, a place mostly glimpsed from the window of a speeding train, where there is nothing going on to speak of and a big night out would involve venturing out to, say, Watford – and overall I think it stands up. I love the sixties tactic of putting their shadowed logo on the record – two guys in dark silhouette, bopping around and having the time of their lives – and mostly, on the surface, the music is bright and catchy. It’s too bad that the album begins with perhaps its worst song; “Bad Boys” was Wham!’s third single, after “Wham Rap!” and the breakthrough “Young Guns,” and although it was also, at that time, their biggest hit, being kept off number one only by the omnipresent “Every Breath You Take,” it never gets played now, and listening to it you can see why; the soulboy/dole boy theme was palpably running out of steam, and so it turned into an attack on that oldest of pop tropes, the parents who Just Don’t Understand. “Don’t try to keep me in tonight,” warns George, “because I’m big enough to break down the door!” But elsewhere in the song he says, “Now I’m nineteen, as you see,” and as Julie Burchill commented in the NME at the time, his poor parents are probably wondering why he’s still living with them. He’s nineteen – in fact, when this album came out, George had just turned twenty – and the underlying question has to be: why is he still there, why has he not moved out into his own place, got on with his own life? So his complaining now comes across as petulant rather than defiant. But “A Ray Of Sunshine” is fabulous post-Lexicon pop, with vibey keyboards, subtle speeded-up backing vocals (“Watch out boy”), purposeful handclaps and one of the greatest beginnings of any pop chorus: “Sometimes/You wake up in the morning with a bassline.” The song’s stride just makes you want to leap out of bed, go out and get a suntan, but there are also hints of a hidden vulnerability (“Can’t you see that I’m ready to dance?/Without this beat my life would fall apart”). “Love Machine,” a cover of the Miracles’ 1976 hit, is done as a pretty faithful replica of the original (down to the recurring walrus groan, although George’s vocal is rather more like Smokey Robinson than Billy Griffin) and also serves as a tribute to the duo’s roots and a reminder that not everybody in the mid-seventies was touched by punk; a considerable number of people adhered to soul and disco, got down to Double Exposure, T-Connection and Roy Ayers (indeed George’s own musical epiphany came one Saturday evening while in the bath; he had Capital Radio on, and on came the Gap Band’s peerless “Burn Rubber On Me.” George leapt out of the water and knew that this was what he wanted to do). 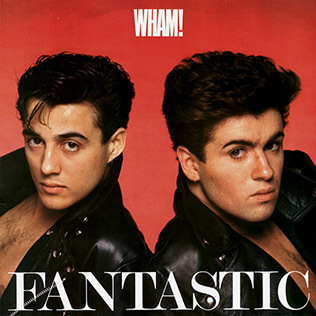 If “Wham Rap!” is challengingly defiant, then “Club Tropicana” reminds us of the fantasy element implicit in the album’s title. The song is bookended by sound effects; first, somebody getting out of a car (echoes of “Love Is The Drug”) and walking towards a club, with booming music increasing in intensity the nearer it gets; then, at the end, chirping crickets and an air of exotic otherness, as if the clubgoer has been transplanted into another part of the world. Rather than being an unthinking celebration of Thatcherite indulgence – a conclusion nobody could draw from watching the video, which depicts George satirically pouring the contents of his drink into the water in which he is bathing – “Club Tropicana” is a tribute to the ability of The Club to transform the ordinary person and make their life transcend itself; the notion that you can go to a crappy-looking nightspot in St Albans or Hitchin and end up somewhere else. You are always aware that this is not exactly real, but there is something within the walls of the club which the clubgoer can’t get from their normal life. There is some terrific jazz piano from ex-Sensational Alex Harvey Band keyboardist Tommy Eyre and some fine bass slapping from Deon Estes. By the end of the song, the point is that you are ready to get on the ‘plane and fly away, get the hell out, exceed yourself. Whereas “Come On!” could aptly be retitled “Occupy The Disco”; it is the most political song on the album, as George puts the boot into “greedy men in far-off places” and dares them to stop his party, his fun, his life. “No way that they’re gonna spoil your fun!” he sings. It doesn’t matter if The Man tries to shut his scene down (“Don’t even bother to let us know/When you flick the switch and stop the show/…And we’ll still be dancing, AS YOU RUN NOW!”). Remember that, in 1983, the world could still have ended at any moment, and George is acutely aware of this: “Oh no, don’t think that I’m not scared,” he says, “I just take each day as it comes/Because it may – it may – IT MAY BE THE LAST ONE!” He is past caring: “I know they don’t care about me…/And I know they don’t care about you/You may – as well – enjoy your life as I do!,” echoing “Wham Rap!” The music is the kind of life-affirming funk-bop that stops graves from being dug. The record ends with their second single and first hit, “Young Guns,” a fine and punchy record musically (and note the presence of, amongst others, Anne Dudley and Brad Lang in the line-up) and lyrically an unintentionally hilarious one – or was there another subtext in its warning against marrying too young? Andrew is finding it a drag being dragged around furniture stores (the female rapper is Shirlie Holliman, the future Mrs Martin Kemp) compared to the great times he had hanging out with George. Their extravagant dance routine on TOTP – maybe leather and studs were where they were at – pretty much completed the subtext for those prepared to read it. Still, the final, cross-vocal tug of war – “GET BACK! HANDS OFF! GO FOR IT!” – is exciting enough to make you want to read on; the album proper ends with a silly slapstick run-through of Winifred Atwell on the piano (“Black and White Rag”?). But, as is not uncommon in such cases, one song on the album isn’t like the others, and here it is “Nothing Looks The Same In The Light,” the record’s only ballad (though it’s more midtempo than slow), written, sung and almost entirely played by George Michael – the only thing he doesn’t play is the drums, which, as on most of Fantastic, are handled by Trevor Morell, formerly of the really very strange sixties/seventies jazz-soul-MoR trio The Peddlers – and all of a sudden we get a glimpse of where this insecure young man is heading. There is no real indication on Fantastic that one of these people will become one of the most popular musicians on the planet, just as one has to remind oneself constantly that this is a duo (Ridgeley’s guitar chugs along like a reliable suburban train throughout most of the record, although his only co-writing credits are for “Wham Rap!” and “Club Tropicana”). However, “Nothing Looks The Same…” is a reflective, almost ambient ballad about what is essentially a one-night stand; George is waking up in the morning – so much of this record is about partying, but only this song really deals with what happens the morning after - but instead of basslines or rays of sunshine, he merely observes the sun, shining on the bedsheets. He is not quite sure what to do, or whether he still feels for this person what he felt and probably said the night before. A large part of him wants to go: “It’s been a pleasure – see you around,” goes the refrain, answered by a falling keyboard figure like the world benignly crashing down around him. His Other – note that he’s very careful not to give his lover a gender – is still asleep, but he himself cannot sleep. It gradually transpires that in reality he’s afraid of himself, and he wants to stay. Why? “Because you’re the first,” he whispers tremulously, sounding exactly like David Cassidy. So the song is about revelations, and newness, and natural fear and doubt. But it is a confronting of the gulf between two different perspectives on the word “fantastic,” and the record’s clearest sign that he won’t be happy staying at this merry level. The album is dedicated to Andrew Leaver and Paul Atkins. Both were schoolfriends – Leaver even played in The Executive – but one died of cancer aged just twenty, and the other in a car crash. Already with George Michael, the ghosts of his life are threatening to become the wildest of winds. Nothing looks the same in the night is, along with the gorgeously opaque, Blue (Armed with love) the most substantial lyric of Wham! 's brief career in my view. The singles told their own brash story and often grated with their air of studied calculation, at least from Make it Big. It's easy to draw a line from these songs to A Different Corner, for example. All the signs of oppressive vulnerability here were evident for those who cared to look. The enduring mystery for me is just how much George Michael has struggled for material over the years, how his albums up to and including Faith seem pretty threadbare, especially compared to the likes of Prince and Madonna. And along with this his sheer reluctance to unleash one of the great voices of his era. The Sony court case was one mitigating factor but was an innate self-doubt another? Even at the height of his fame a haunted self-consciousness seemed to envelop him and as the review ponders this apparition of uncertainty was there from the beginning. Refreshing to actually encounter some serious insight into albums that are deemed by the cognoscenti to be beyond debate. When surface was depth indeed! A fair assessment of a mixed bag. I'd liked the first two hits but had real problems with Bad Boys, for the same reasons you mention, and unfortunately Club Tropicana coincided with a grim job I had doing up a badly fire-damaged house. It certainly smacked of Home Counties Thatcherism to me. Though I've never doubted George's heart is in the right place politically, he could be terribly naive and ambiguous. Ray Of Sunshine is wonderful, the single that got away. Thanks for reminding me of it. Presumably "Burn Rubber on Me" was being played by Greg Edwards - one of several Capital shows with no real national equivalent (indeed, the warmest and most natural of their specialist presenters back then - and among the most publicly-minded of all broadcasters - has only very recently been where he should have been all along, but could not be because of paternalism, the whiff of Empire and enforced separation of responsibilities; when he talks about Peel's importance to reggae you know he knows that turning people who had barely travelled beyond Somerset or Shropshire market towns on to it was the most important thing Peel did, and shows less bitterness than I probably would that the structure of Savile & Travis denied him that right). "Nothing Looks the Same in the Light" for me has a lot more soul than a lot of his later performances which *announce* their Soulfulness, a very common story in this country. The emotional restraint redefines soul, creates its own sense of it.